Meet the YOLO crew – A mix of locals and transplants that help make your Anna Maria Island adventure an unforgettable one. From our USGC Licensed captains, to our knowledgeable crew members and our resident water dog the YOLO crew wants you to feel safe and comfortable when exploring the skies and waters of AMI. 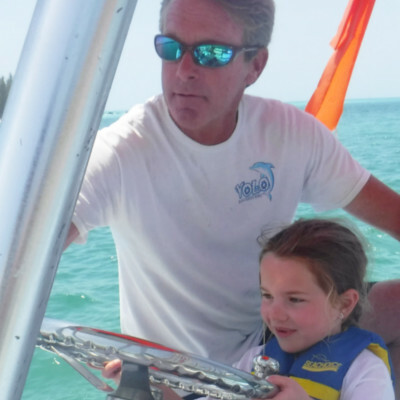 A true Florida Native with a lifetime of boating experience, Ryan is an international parasail trainer, licensed as officer in charge of navigational watch, able to operate commercial towing vessels, and captain a vessel 100 gross tons. He is certified in CPR, first aid, and basic boating safety. During Operation Enduring Freedom, as a member of the military police, Sergeant Davis was assigned to water patrol security for Central Command and was trained in diesel mechanics. Ryan has also captained boats for URS construction surveyors during the building of the Gulf Stream Pipeline. Growing up with the water as his back yard he can tell you all you need to know about the area and its wildlife. Almost a Florida Native, as he was transported from New Jersey to Manatee County, Florida at the age of 4. He considers himself a “local”. Guy’s love for the water and boating as a child was costly when it came to prop replacement. It is said that practice makes perfect and that is true in Guy’s case. He currently holds a Master Captain license and is an excellent boatman. He was a navigation officer in the United States Navy which attests to his knowledge and expertise on the water. Guy maintains the high level of professionalism taught to him during his tour in the military. Nate was born an raised on Anna Maria Island. He grew up on the water and spent plenty of days at the local Marina his father ran. Today he is able to share his love for the water with his daughters and wife. When Nate is not enjoying the water, he is a full time Fire Fighter at the station down the street. So if you ever have Captain Nate as your captain know that you are in the best of hands! Captain Mark has been living on this beautiful Island for over 35 years (which is 5 years longer than he’s been alive if you believe him). Originally from Ohio he moved south and forgot the way home. He has held a Masters 50 ton license for over 20 years and has more knowledge of the local wildlife and environment than anyone we know. Before he joined us at YOLO he operated a 40ft Charter vessel, delivering boats to and from the Caribbean, Miami and the Keys, educated the youth of today as a teacher for over 15 years and even moonlighted as a super hero at weekends! He now works with us as our Sight Seeing Captain and we are lucky to have him. Scott lives and breaths anything related to fishing. He is so confident in his fishing ability his tag line is “He guarantees to catch at least 1 fish”. Scptt grew up in Bradenton but originally hails from Tennessee. His southern roots run deep, country music, hunting, and comfort foods are some of his favorite things. Did we forget to mention oh yeah he likes to do that too. John loves a good adventure. Previous to coming to Anna Maria Island, John was a white water rafting master guide. He has done over 1000 trips and is an expert on the water. But now he has fallen in love with the tropical weather of Bradenton. John is an excellent shuttle captain making sure your trip out into the gulf is informative and exciting! Disclaimer: Ali is writing this about herself right now. Born and raised in Bradenton Ali keeps coming back to where it all started. She received a business degree from the University of South Florida in Tampa. After finding out the corporate world was not for her, she traveled and found out her passion “making others smile”. And after falling into the parasailing world, it ended up being the perfect fit. She also brings her dog Sasha with her to YOLO so if you see a brown and black dog running around, say hello to Sasha, she loves pets. Kayleen is another Bradenton Native. She loves any out of door activity and usually brings a fishing pole to cast in the water after her parasailing crew shift. Currently finishing up her nursing degree, Kayleen has one of the kindest hearts you will meet. Frank the Tank is the friend everyone wish they had. Frank works three jobs, fulltime firefighter, part-time paramedic, and part-time amazing parasail crew. Frank like the rest of our team grew up in Bradenton and decided that this area is just to amazing to leave.